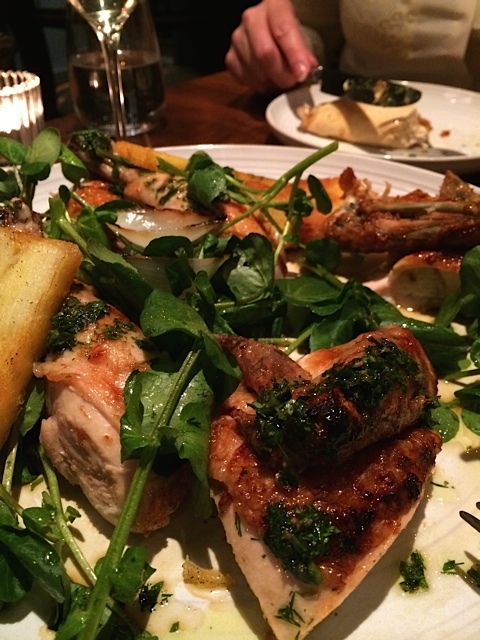 The nearest restaurant to our new home in London is Jamie Oliver’s Fifteen restaurant. Made famous by the television series over twelve years ago, Fifteen is still going strong tucked away just off Old Street roundabout (or silicone roundabout as its now rather oddly known) in a very cool part of London. When we rented this flat of course we knew that our local was Jamie’s but that wasn’t the main reason for living here — honest. In fact it is dangerously expensive to have a restaurant of this quality within one minute’s walk from our front door. It’s not that Fifteen is a costly restaurant per se, compared to London, but like everything else, it does seem to add up! We have already eaten here three times and the most recent dinner was with the sister who was in town seeing us forth first time since we’d moved to London. We managed to grab a table at the last minute (played the local card) and we took our table on a busy Saturday night over the Easter weekend. The vibe was buzzy and loud on the night we were there, it’s more chilled at lunchtime, but Saturday nights are made for letting your hair down and tonight was no exception. All profits from the restaurant go to the Fifteen Foundation so we can be happy that not only are we having a blast, it’s all going to a good cause too. The menu in Fifteen is simple and seasonal, with an Anglo Italian attitude. We opted to share some oysters and a whole rotisserie chicken, which we were told would take forty minutes to cook (it did). 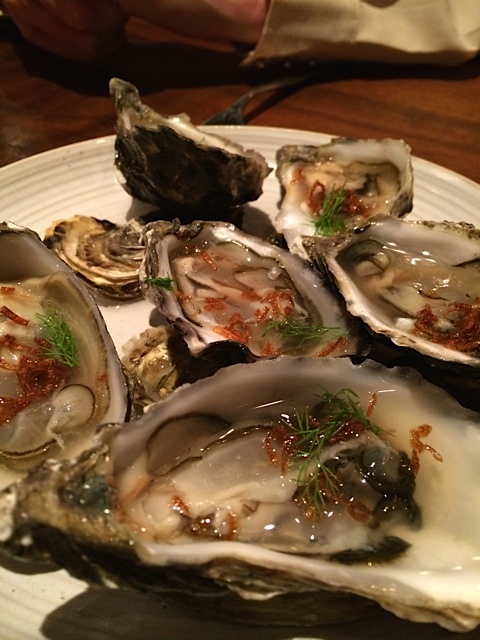 We slurped wine enthusiastically — like one does —quaffed the oysters and happily waited for the chicken to turn up. I’m not one for waiting an overlong time for food in restaurants but this was OK actually, if you’re not very patient I’d suggest ordering something else from the menu. The oysters were beautiful, particularly the caramelised shallot pickle and chicken was simply roasted, but came with a peppery salad and summery dressing.